Provide comfort for the family of John DelDuco with a meaningful gesture of sympathy. John A. "The Duke" DelDuco, Sr., 82, died on Thursday, February 7, 2019 at Sharon Health Care Center in Sharon, CT.
John was born on January 21, 1937 in Yonkers New York and grew up in Mt. Kisco, NY. He attended school at St. Francis of Assisi being raised Catholic. John was an altar boy and sang in the choir. At 16 years old, John quit school to help his father support his family. His father worked in demolition doing a lot of road building. At 17, John joined the Marine Corps where he received more training in construction. But after two years the Chief of Police and the Judge of Mt. Kisco wrote to the Marine Corps requesting John's release. As the oldest son he was needed to support his family as before, but even more at that more because his father was badly burned in an accident and needed several years to recover. 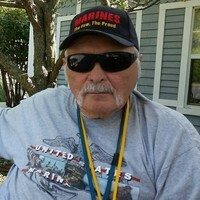 The Marine Corps gave John an "Honorable Discharge." At 18, John was working all week, that is seven days, weekends and holidays supporting seven people with the help of a brother. John met his wife on a blind date. He said, "She was one of the three prettiest girls in town." They married when John was 20. They were married for 25 years having two boys and a girl, seven grandchildren and nine great grandchildren. John adored his family. He always held his hand over his heart when he talked about them. John, "Johnny" or "Duke" as many knew him by, was born to Anthony and Dorothy DelDuco. His greatest pride were his grandchildren (second to his children). He was proud to have served his country as a Marine during the Korean War as evident by his constant display of patriotism. He always worked long hard hours, six to seven days a week to support his family. When his father recovered, he continued to work with his father in Mt. Kisco for the family business, DelDuco and Sons. While residing in Brewster he belonged to the Operating Engineers. Alongside his brother-in-law, Chuck, wife and eldest son, he worked hard to build his family a home in Carmel NY where he would remain until his children were grown. Thereafter he had precious time with his soul mate, Bonnie. Together they were adventurous enjoying tag sales, weekend get-a-ways and even white-water rafting. They lived life to the fullest and enjoyed their grandchildren. He stayed by her side and nurtured her until the end. After time had passed, he revisited past loves as it meant a lot to him to have companionship. At the young age of 72, he had a massive stroke which left him paralyzed. He would live out the remainder of his life in a nursing care facility. There he still found purpose and loved to see his grandchildren visit. He was on committees and was a strong advocate for the residents. He is survived by his former wife Barbara DelDuco of MD; Son John, Jr. and his wife Pam DelDuco of MD; Daughter Beth McKinney and husband, Tony Grom of NY; Son Michael and wife, Nancy DelDuco of SC and daughter Jody Brown of FL. He is also survived by Brothers, Anthony DelDuco, Joseph DelDuco, Michael DelDuco and Brother-in-law John Constantino; Grandchildren Brooke, Ryan, Ashton, John, James, Patrick, Kate and Meghan; Great grandchildren Nicolas, Kayla, Angelic, Gaius, Quorra, Augustus, Willow, Amelia, Annabella, Nikko Marie, Vienna and many beloved Nieces and Nephews whom he loved deeply. He was predeceased by his beloved Sister,Tina Constantino, Bonnie Niebuhr and Virginia Wychunis. Calling hours will be held from 11 a.m. to 12:30 p.m. on Saturday, February 16, 2019 at the Hufcut Funeral Home, 3159 Route 22, Dover Plains, NY. Funeral services will take place at 12:30 p.m. at the funeral home. Burial will military honors will follow at Clove Valley Cemetery, Clove Road, Lagrangeville, NY. For directions or to send the family an online condolence, please visit www.hufcutfuneralhome.com. To send flowers in memory of John A. DelDuco Sr., please visit our Heartfelt Sympathies Store. Provide comfort for the family of John A. DelDuco Sr. by sending flowers. Beth and Tony and family, So sorry for your loss. Many prayers are being sent to you all.